The question never considered by the Establishment. "In your quest to destroy British culture did you ever consider the dreadful and murderous consequences?" There are so many others, of course. However our secretive and underhand betrayal of centuries of development and social improvement has been wrecked. Forget for a moment the annihilation of our services and NHS capability to cope, the now desperate desire to concrete this no longer green and pleasant land with the future slums and ghettos. Forget the destruction and obsessive need to destroy aspiration for excellence and the hard won quality of deserving individuals. Let us concentrate on the Balkanisation of Britain. Regardless of the Scottish referendum, the United Kingdom is already a busted flush. One permitted to happen by deliberate action by the Establishment and in particular Labour. The "Trojan Horse" is a media "clever clogs" phrase to describe what is, in reality, conquering by invitation and collusion. We now have a Nation petrified to use the words necessary to garner the truth of our subjugation by ignorant, third world fanatics, brainwashed into believing in mythology and barbaric,misogynistic behaviour, no further advanced than the middle ages. I believe fervently in the teachings of Christ and the ten commandments as templates for human social cohesion. All other faith and tenets I hold are not required to be used to subjugate or dominate others. Certainly not to use as an excuse to slaughter and conquer. Not to vilify and bully children and others holding different feelings and faith. Why this Country's Establishment determined that Islamic, childish beliefs, should be given greater prominence than any other, beggars belief. It is a culture which has no place in a 21st century society and is abhorrent in so many ways. Birmingham educational collapse to these moronic imports was engineered, comes as no surprise and is endemic to every major conurbation. Michael Gove's anger with a Home Office hell bent on nurturing and expanding Islamic dominance is extremely understandable. Theresa May's Department is but an office for the facilitation of an expansion of immigration with an Islamic bias. After pounding Iraq, Libya and Afghanistan we now shrug and encourage, at the highest level of Civil Service arrogance, the Islamification of Britain and the EUSSR. Behind the scenes our Masters are reducing our defense capability, whilst helping to fund a new force, soon to be heavily populated with Turkish Islamic personnel. Even this is not a "Trojan Horse" when done by invitation. One Leader prepared to recognise these horrendous dangers and future bloodshed and strife, is Putin. In our world of global trumps national politics, Vlad is the new "Enoch". Little wonder his press is so awful by design. Much in the manner of the spat, so called, between Gove and May. Both ministers with with departments little more than poisoned chalices, bequeathed by the treacherous and abominable left wing creatures. People so very much of the mindset of Pol Pot. Kill all who might hold different opinions or be of senior intellect. 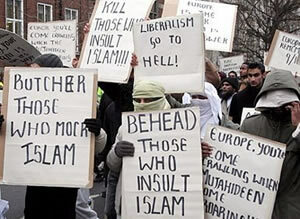 Those included the more moderate Muslim leaders. Men prepared to prosecute their beliefs quietly and decently. A minority, sadly. Whether our Nation has the ability to stop the march of radicalism and prevent a future soaked in evil and barbarity my generation will never know. In my heart I believe it is already too late. Not only our schools but our Universities are under the same onslaught. One you dare not argue against. If lucky, you are called silly names such as Islamophobic or "little Englander". If unlucky you might get the Lee Rigby treatment. The latter likely to dominate, in 50 years time. I suspect Gove and May share the same abhorrence of such a future. Both frightened to be seen to have been a part of an Establishment entrenched in its desire to nurture the bloodbaths to come. Ones which will carry the playground enactments of now into adult slaughter and cruelty. After all, our Crusader ancestors feared such a frightening scenario centuries since. What would they make of our immigrant hordes accepted without qualm by today's Establishment? One entrenched in our institutions, top to bottom. Evidenced by their power to cause such unnecessary friction in the very heart of Government. I think, on careful consideration, that I am a "swamp drainer".